Jaguar XF joins the Black Pack | What Car? Jaguar XF buyers can now give their car a stronger, more aggressive look with the company's new Black Pack option. The XF Black Pack brings 20-inch dark grey Draco alloys with diamond-turned rims, a gloss black grille and black window surrounds. 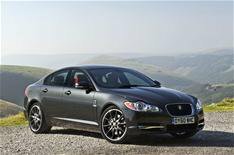 It is available on the 3.0D, the 5.0 V8 petrol and XFR models. Prices start from 950.